The Cambridge SoundWorks MovieWorks HD isn't actually a new product. We first saw it last year January at the CES 2008 when it was still known as the Creative Xdock HD. It was said to retail for $619 but boy, what a difference a year make! This baby could be yours now for just $249 (yes, still pricey but I was comparing it to the inital price)! 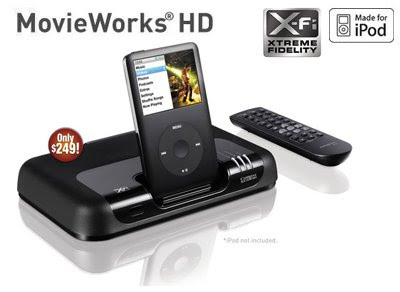 Norminated for the Best of CES, the MovieWorks HD allows you to upscale your iPod videos to 1080i and also enhances your music with the X-Fi audio technology.